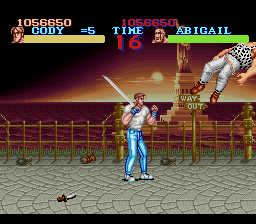 Final Fight, Influenced by the film "Streets of Fire", involves the kidnapping of Mayor Mike Haggar's daughter Jessica after Haggar refuses to work with the Cities Gangster Mad Gear. 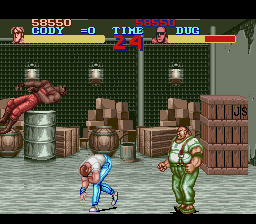 When the Mad Gear thug Damnd contacts Haggar and informs him, Haggar calls up his daughter's boyfriend Cody and the two head into the streets to bust Mad Gear's gang. 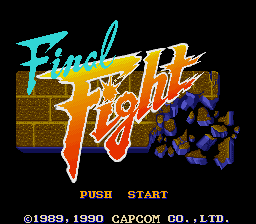 Final Fight is a side scrolling Beat-em-up typical of the late 80's-early 90's style, featuring excellent large and detailed sprites. It was a number 1 hit in the Arcades and set new standards in the genre. It was just a matter of time until Capcom ported it onto the Super Famicom. The conversion is not Arcade perfect however, all the moves and enemies are there. Unfortunately due to the memory size of the cartridge you are limited to select from 2 characters; "Cody" and "Hagar." During the course of the levels you will fight various gang members using your fighting skills, along the way you can use a number of weapons that are at your disposal. The weapons can be useful as they can quickly reduce the energy of your enemies, the pole is one of my favorite weapons due to its long reach. Be careful though and don't rely on the weapons too much as the thugs can gang up on you!! A unique feature for Final Fight is each thug has an energy bar so you can determine when you can finally beat them to submission. During the levels you can collect food to help replenish your health bar after a beat down, although when you have used all your 3 lives you have the option of switching to the other character. At the end of each level you fight the end of level boss. The bosses tend to use some tactics whether it is the element of surprise, using weapons or beckoning their cronies into the fight. Some strategy is involved and this is really where your reflex and skill needs to be sharp. The controls are very fluid and very responsive just like the Arcade. Each character has different abilities like strength and power moves. Haggar is powerful enabling him to hit harder, he also has good grappling ability. Cody has youth on his side so he is very quick and agile. Because of the 8 Meg cartridge, the 2 player option is missing, level 4 (industrial zone) was left out and some of the animation has been cut. But if you have never played the Arcade version then it really does not make any difference, this version is excellent. My only negative view with the Super Famicom version is the missing 2 player mode, a real shame. There are a total of 5 great crazy slug fest levels, fighting on the streets, subways night clubs and other locations around "Metro City." 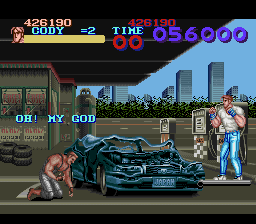 There are also 2 bonus levels involving wrecking a thug's car and smashing glass panels in a factory. 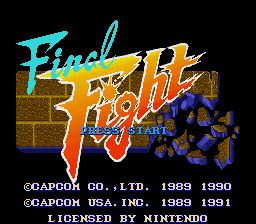 Final Fight is a title that I would not really say is rare however, there are periods on Ebay when you just can't find any and periods when they appear. Expect to pay £17 (MIB), £13 for (CIB) and £5 for a loose cart. Some sprites start to flicker at times when a number of enemies clash. 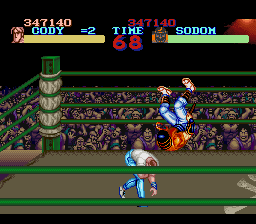 Final Fight is an excellent game featuring stunning large detailed sprites and superb graphics, it was visually stunning for its time. Compared to the classic "Double Dragon," it took the genre to a new playing level and set a new bench mark for the Beat-em-up. To this day I feel if Nintendo stalled the release then we would have seen a far better version as close to the Arcade perhaps? But they needed to release as many hot titles in order to stay way ahead of the Mega Drive. Capcom intended Final Fight to be the sequel to the original "Street Fighter" but at the time Capcom felt that the one-on-one Beat-em-up was not popular enough due to the failure of Street Fighter in the Arcades. So own a piece of gaming History with one of the greatest Beat-em-up's of all time, a classic! !